Countdown Sales Timer comes with a number of options for customizing the placement of your timers. You'll find these under Options>Position in the Appearance section of the timer editor. 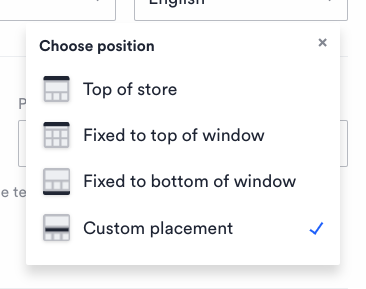 The first three options should work well for most themes and stores (more on how to use them here) however we've added a fourth option—Custom placement—for stores that need more flexibility when it comes to the positioning of their timers within a page. If you're simply looking to target your timer to a specific page, you can do so using the Target page option under Options at the bottom of the timer editor. 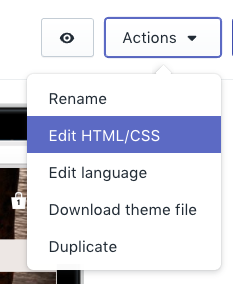 Please note that while this feature is accessible to everyone, we highly recommend having some familiarity with HTML and Liquid (Shopify's templating language—learn more about it here) before embarking on a custom placement adventure. Step 1: Select the last option ( Custom placement) under the Options>Position setting in the app, and save the change. Step 2: Navigate to Online Store>Themes. Step 3: Click the Actions dropdown button (it's next to the purple Customize theme button) and select Edit HTML/CSS. Note: While you can create as many timers as you want using the regular positioning options—if you have a paid plan, that is—we highly recommend publishing only one custom placed timer at a time. Also be aware that each theme's templates and sections are coded differently, there is no definite and widely-applicable answer for where to place the above snippet. In general, the higher up you paste it in the code, the higher up it will appear on the page. If you're looking to learn more about editing your theme's files, these two articles might be helpful. And if you're really stumped with where to paste the code to achieve the placement you're looking for, our friendly support team is always happy to help. Get in touch!